Bradley Wright-Phillips arrived in Harrison, New Jersey for a trial in 2013, after a disappointing career in England – however, after six years stateside, he would become a New York Red Bulls legend. When he signed for the Red Bulls, many fans didn’t like the signing saying “failure in English football” and “I don’t even want the better WP brother, let alone his brother”. However, things would quickly change…..
After disappointing cameo appearances after joining half way through the 2013 season as BWP scoring just a solo goal, the head coach, Mike Petke, tried to cut Bradley Wright-Phillips from the squad. This was actually in fact the second time Petke tried to cut Bradley from the squad, having already tried to cancel his trial. 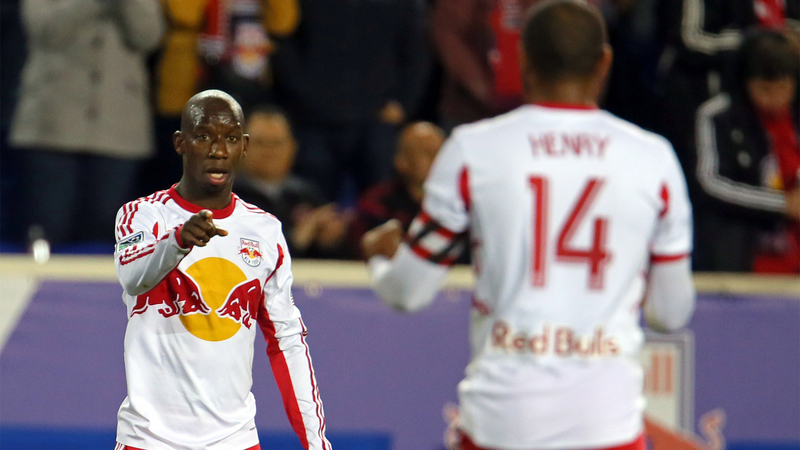 Thierry Henry’s link up play helped BWP score 27 goals in 2014. A legend was in the making. Following the 2014 season, Mike Petke was sacked as head coach, and replaced by former USMNT midfielder, Jesse Marsch, and despite huge fan backlash, and much doubt over the capability of the RBNY squad – the franchise shocked everyone as they won the Supporters’ Shield – the second in three years, as BWP scored 17 goals in the process. The 2016 season didn’t bring much club success but was a massive year for Wright-Phillips as he scored 24 goals, winning the Golden Boot for the second time. He also broke Juan Pablo-Angel’s record as top club goalscorer as he scored 63 goals, breaking JPA’s 62. He still holds the record to date, with the current tally 118 goals – and still going up. Not to mention he scored more goals against rivals NYCFC, including two in the 7-0 victory at Yankee Stadium, more commonly known as the Red Wedding. Bradley also ranks fourth on the all time apperances for the New York Red Bulls, but by the end of the season, is likely to overtake Mike Petke and Dax McCarty and take second spot. The 2017 season was definelty a rebuilding year for the franchise, but BWP did what BWP does best. Score goals. Score a lot of goals. Once again, he scored 17 goals, and finished 6th on goalscorers. He also scored a late goal in the USOC Final, but it was too little too late for the New York Red Bulls as they lost the final 2-1. Halfway through the season, 2018 looks good. So far, he’s scored 14 goals in 21 MLS league games, scored his 100th goal, he’s 3rd on Goalscorers, and the club are easily in the top four teams in the league, and could win a third Supporters Shield, being just six points behind with a game in hand, another 13 games to play yet. After scoring his 100th MLS goal, BWP took off his 99 jersey to unveil a 100 jersey. BWP has resurrected his career from death, he’s openly admitted that he sometimes would turn up to training drunk during his days in England, but he’s came state-side and became the greatest ever athlete New Jersey has ever seen. A legend, a name that will go down in New York Red Bulls’ history. Make no doubt about that. Teammates, coaches, friends and family congratulate @BWPNINENINE on becoming the fastest to hit 100 goals in @MLS history. Amazingly, BWP has come on so much since moving to the Red Bulls, he has now scored more goals in six years in the States than in his whole career in England. As you can see from the stats above, not only has he scored a lot of goals for the franchise, he has also provided his team-mates with goals, with 21 assists in the six seasons. He has also never been sent off in a Red Bull jersey. How Did BWP Do This? Obviously having a player like Henry around in 2014 helped him score 27 goals, and there was a lot of doubt whether he could carry this on without him, obviously he has. Another big reason is that Wright Phillips has finally settled down and taking the game seriously, back in his playing days in England, he would stay up to 1am/2am drinking, and watching cartoons before going to training the next morning. Since moving to New Jersey, he has became a top pro, he’s stopped drinking, and takes training much more seriously. Another big factor of the number of goals he has scored, is down to the quality of his team-mates. From Thierry Henry, Dax McCarty, Sacha Klijestan to Kaku, BWP has had some great players assisting him throughout the years. The final factor I believe has helped him achieve this landmark is the home support called “The South Ward” which consists of two supporters group, Empire Supporters Club and Viking Army. They are so passionate, and sing every game until the end no matter what result. BWP – Best Ever RBNY Player? Theres three groups in the southward. I thought GSA got their official membership revoked so I thought it was now only ESC & VA? I will change it, thanks for letting me know!